Lines of the Vibro Compression Machines for building materials: stones concrete GOST 6665-91, slab of sidewalk concrete GOST 17608-91, stones concrete wall GOST 6133-99. This machine ST-KRM by ST is ideal for a most economic mass production of paving stones, concrete bricks and other building elements. 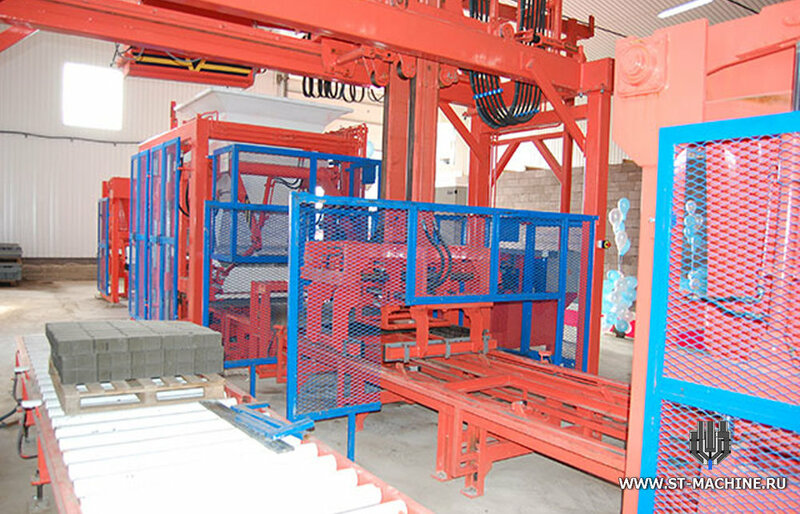 Present day production of building materials is primarily a high level of automation and stability of quality characteristics of output products. 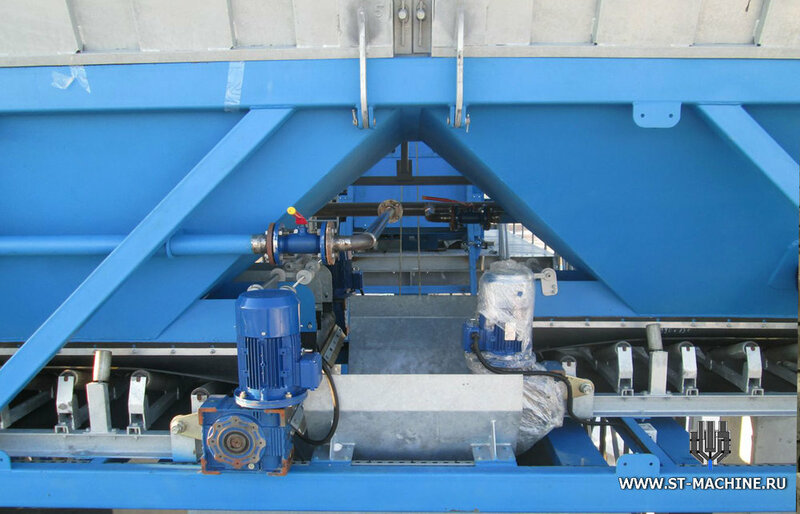 The Concrete Mixing Plants ST & the Concrete Block Making Machines for building materials production offered by the Company "ST-MACHINE" are characterized with a long service life, high reliability and quality of output products. Silos for the storage and loading of dry bulk materials by ST-MACHINE. Within them, ventilation is organized, not allowing the contents to be absorbed by moisture and pre-ideal conditions for cement. Such structures are in demand where there is a daily need for dry building material for the preparation of mixtures for various purposes. These are enterprises that produce reinforced concrete products, and compact production shops specializing in molding products, and any large construction. Construction of dry storage ST is reliable enough. 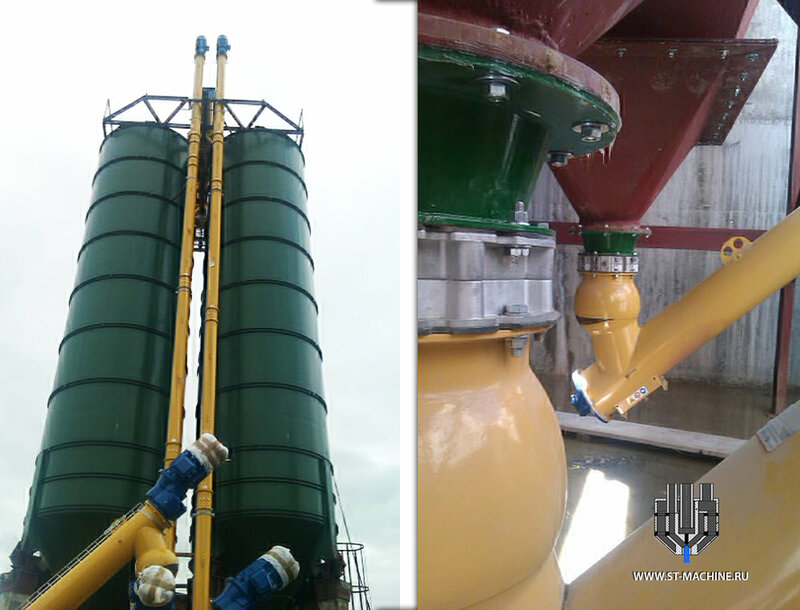 Cement silo is a metal cylinder mounted on supports, with a removable upper head and a lower conical. The stationary ones are mounted on a concrete foundation and fixed with powerful anchors. Inside and outside the walls of the bank are welded stairs with fences for convenient maintenance. In the upper bottom for the same purpose is a hatch, through which you can get inside. The most difficult part of the repository is the upper one. Here there is a loading cement duct, a pressure relief valve and a filter in a metal casing. The cement dust trap is included in the basic equipment, but depending on the financial possibilities of the buyer, options are offered. 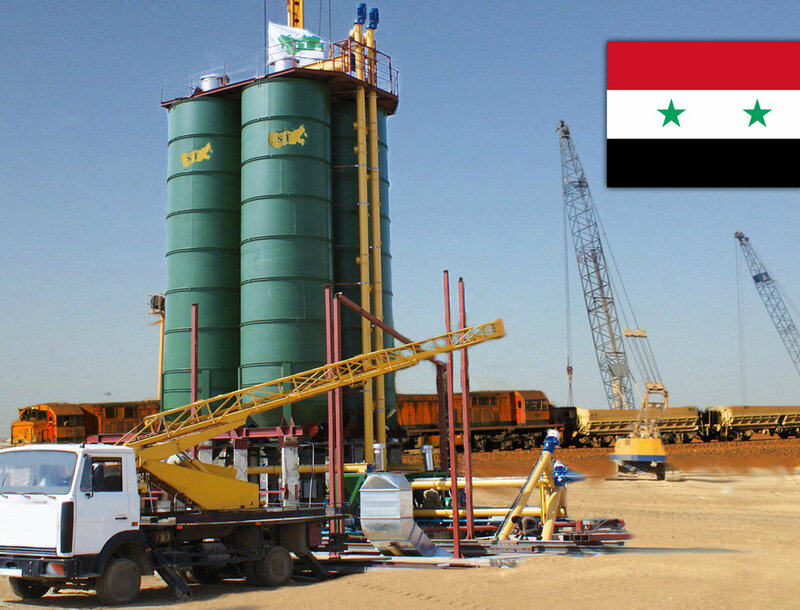 Cement warehouses ST are located near the railway line in Syria. 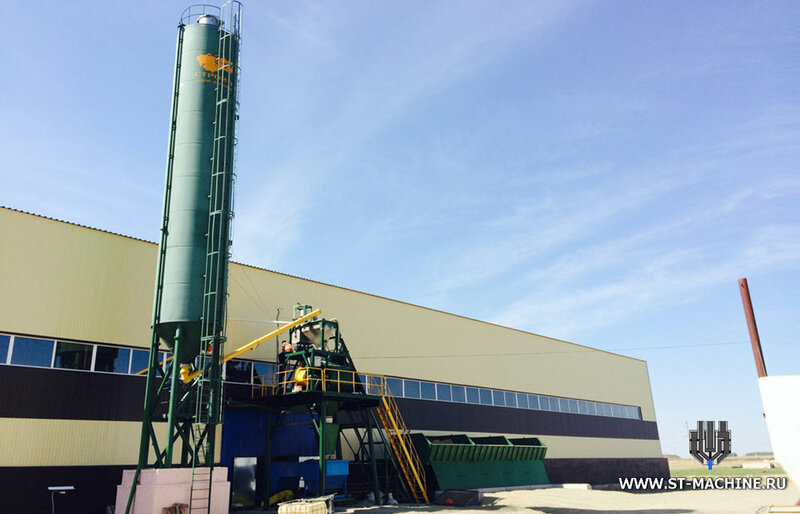 The specialists of our company have already completed the construction of the concreete mixing plant ST-60 with capacity 55-60 m³/h and different equipment for the production of prestressed concrete elements in Kokshetau city of the Republic of Kazakhstan. 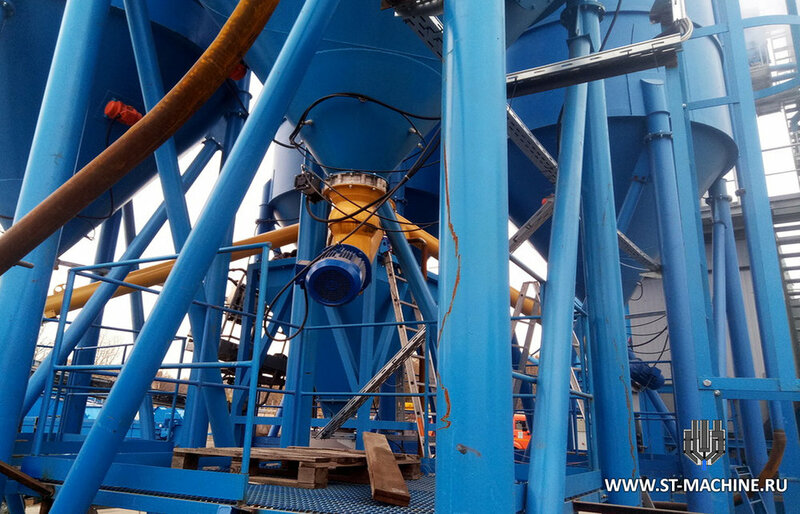 The heart of this plant is twinshaft mixer, produces 1,5 m³ of concrete per batch. 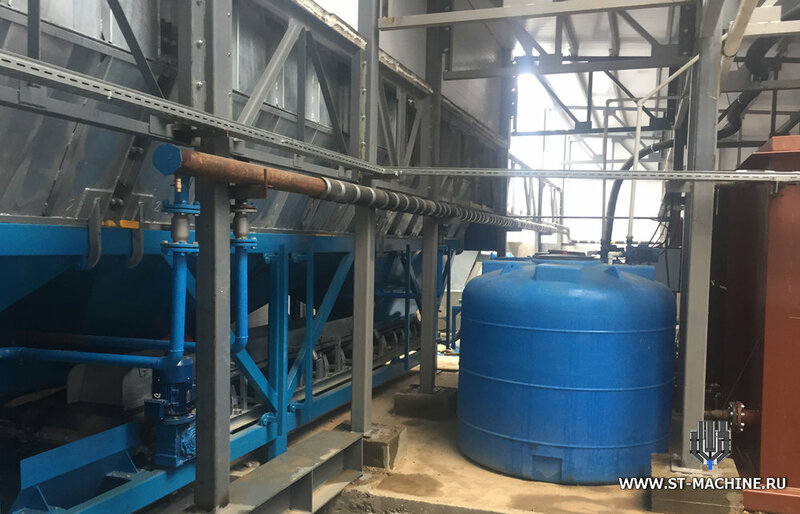 The dual-function water distribution system, which is used to distribute the water uniformly within the mixer while ensuring better homogeneity of the mixture, could be used for cleaning also. For cement storage, there are 1 cement silo. There are 3 aggregate storage bins, each has 15 m³ storage capacity and each is equipped with dosing belts with speed control which provides feed rates that are fully adjustable for the aggregate. It is possible to have a precise control over mixer design with specialized dosing system and automation system to adjust flow rates. The staircase mould was specially produced in October 2017. Dimensions: 3730 x 2450 x 2060 mm. We can provide numerous solutions for manufacturing staircases and landings: from simple moulds or double battery moulds for fixed, standard staircases to flexible moulds for staircases of various shapes and sizes. 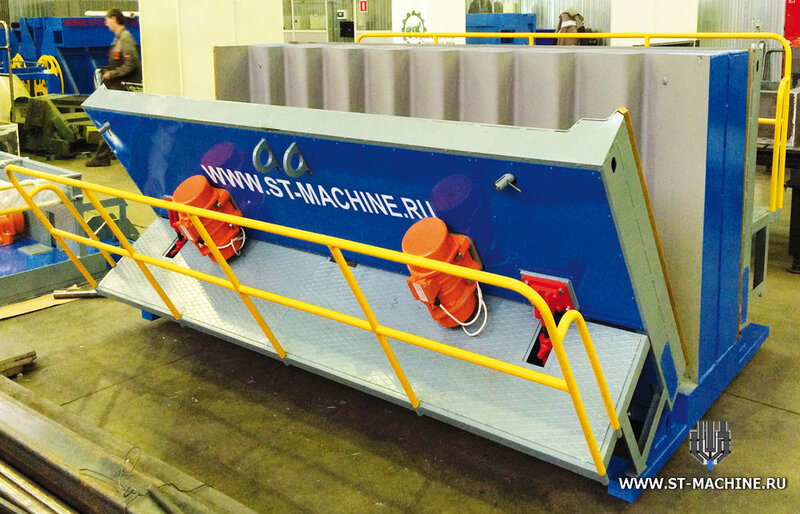 ST-MACHINE is supplied moulds and tilting tables. The Cement Silo by ST-Machine with a capacity of 400m³ was build as close as possible to the asphalt plant BENNINGHOVEN in Moscow. The warehouse equipment ST-400 includes four silos of 100 m³ each (+ air filters and aspiration, valves, pressure sensors upper and lower levels and the aeration system). Horizontal Cement Silo ST are much sought after product by Concrete manufacturing companies for their ease of working, mobility, productivity and lack of any special civil works.With optional telescopic legs, these concrete silos do not need a crane to be loaded or unloaded from a trailer, or to be installed in an open yard. 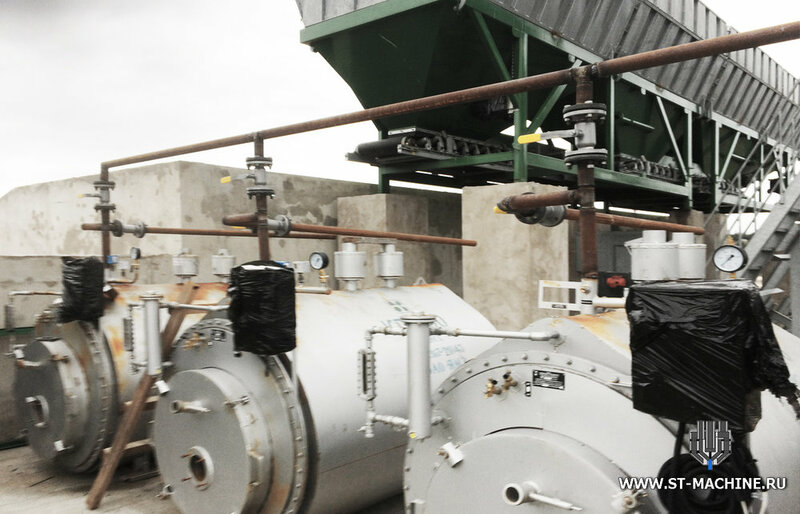 From the container warehouse ST-400 in the supply silo of the asphalt plant mineral powder is fed pneumatic chamber pump by a metal pipe with a diameter of 159 mm. As a leading cement silo manufacturer ST-Machine, we offer Cement Silos ST equipped with Load Cells for continuous weight measurement for accurate batching and cement stock management, depending upon the requirement of the Client. 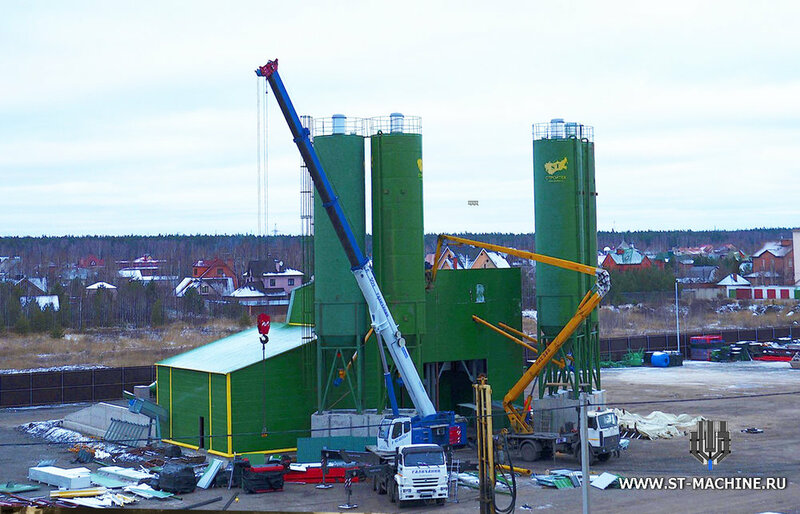 The batching plant ST-60 with capacity 55-60 m³/h with the concrete recycling system. EXCLUSIVE: the aggregate batching systems by ST have been equipped with automatic covers with the open-close functional (remote control). The aggregate storage with a total volume of V=45 m³. Two of the cement silo 80 tons each. Structural elements for all types of constructions: residential, commercial and industrial buildings, as well as infrastructures. This form is intended for the manufacture of stairways (with a storey height of 2.8 m; 3.0m and 3.3 m). The design of the mould allows to produce five different sizes of stairways not only in height but also in width of 1200 mm and 1000 mm. This is possible through the use of the special metal indexable inserts. ST-180 stationary concrete plant has a compacted concrete production capacity of 175-180 m³/h with two twin shaft mixers with high output and production efficiency. By the way, the twin shaft mixers are heavy duty and the most widely used models in the world today. ST-60 stationary concrete plant has 55-60 m³/h production capacity and was preferred with 1000 l twin shaft russian mixer depending upon the requirement of the client. The aggregate storage bins were produced with 4 compartments with V=60 m³/h. Two cement silo - 80 tons each. ST-60, Kaliningrad, Russia. Tetrapod steel mould.